When I first came out of school there was very little in the way of continuing education opportunities online. Almost all continuing education had to be done in person. 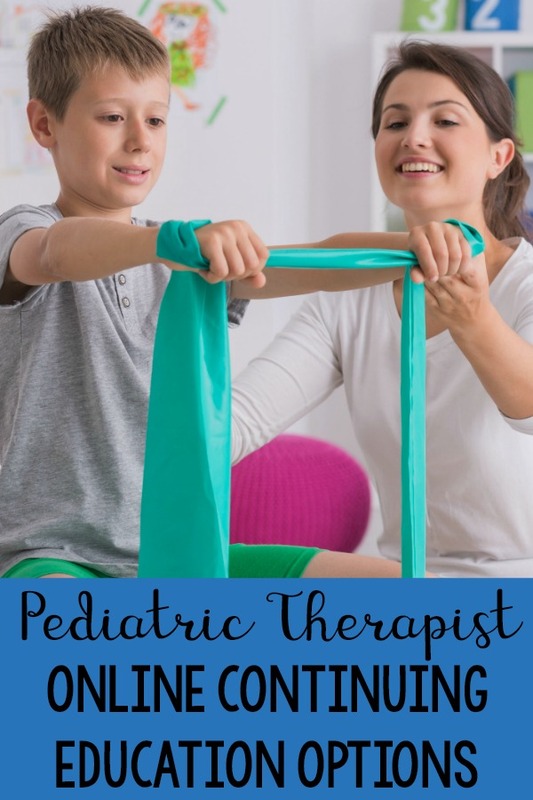 When I switched to pediatrics from orthopedics I felt like I was scrambling to find any pediatric physical therapy continuing education that I could find on demand. Times have changed. I LOVE in person courses, but with the craziness of 3 little children I have come to appreciate that there are now online offerings for continuing education in the therapy field. I also love how online continuing education gives you the opportunity to access class topics that may not be near you whenever you want too! I have been quite impressed with the courses that I have taken online and I’m excited to share with you about the different online pediatric therapy and occupational continuing education courses. Many of these courses can be appropriate for pediatric speech therapists as well. Some of the following links are affiliate links. When you purchase through an affiliate link I earn a small commission from that company at no cost to you. There are lots of great online pediatric physical therapy and occupational therapy continuing education courses. These courses have been a lifesaver for me as a mom of three young children who doesn’t always have the ability to travel or time to take away for courses. When looking at online courses for continuing education purposes, always be sure to look into how continuing education is offered and what your state’s rules are on continuing education. It’s not always as cut and dry as a course that comes to your state. Don’t be afraid to ask questions if you are unsure either! MedBridge – I personally have a membership to MedBridge and have been impressed with their course offerings. I’ve taken courses in pediatrics, school based courses, ethics, and even some orthopedic courses. Since I’ve been so happy with the options I’ve worked with MedBridge to offer a discount to Pink Oatmeal readers. Using the promo code PINKOATMEAL will save you $175 dollars off the membership bringing the cost for an entire year worth of courses down to $200. Continued.com – I’ve also recently just become a member of physicaltherapy.com part of the continued.com family. They have courses available for PT’s, OT’s, and SLP’s. This includes (physicaltherapy.com, occuaptionaltherapy.com and speechpathology.com). I’ve worked with the company to come up with a discount code for readers of Pink Oatmeal. This subscription also gives you another great option for pediatric continuing education courses. If you use the code PINKOATMEAL13 at checkout you will get an extra month for free. So instead of 12 months for $99 dollars you will get 13 months for $99. Pushing Into The Classroom – Practical Strategies for Pediatric Therapists – This course was designed by the PT and OT from The Inspired Treehouse. A great option for pediatric physical therapists and occupational therapists working in the school setting. Creative Pediatric Treatment Strategies Based On The Evidence – This is another course from The Inspired Treehouse. I’ve taken this course myself and enjoyed it! Another great pediatric physical therapist and occupational therapist continuing education course offering for both clinical and school based therapists. The School Based Therapist Handbook – This course is designed for school based pediatric physical therapist and occupational therapist. This course includes insider tips for staying organized and keeping up with crazy schedules Creative ideas for group treatments and pushing into the classroom. Expert advice on the best tools and toys for therapy (on a budget!). Effective strategies for caseload management and collaboration and tools and resources to create impactful, educationally relevant treatments. Summit – This is another option for online courses. I’ve taken courses live from Summit that I’ve enjoyed. I personally don’t have any experience with their online courses, but have heard good reports from those that have taken courses online through Summit. Pocket OT Courses – Cara Koscinski of The Pocket OT has a variety of different online courses that she offers written for primarily pediatric rehabilitation professionals. Move, Play, Thrive Courses – These courses are created by Sonia Story. Sonia specializes in teaching Neurodevelopmental and Integrative Movement Courses. Another great online continuing education option for pediatric therapists. Primitive Reflexes 101 – A course on reflex integration from ILS Learning Corner. This course is only open at select times. OT School House – If you love listening to podcasts this is for you! Listen to their podcast, take a quiz, and earn professional development! For a school based pediatric therapist this is a fun and unique way to earn continuing education credits. Professional Organizations – As members of different professional organizations such as the APTA or AOTA, online continuing education opportunities are available for you. This includes both free and paid courses. Intro To Pelvic Floor – A course created by an occupational therapist. As pediatric therapists, we work with lots of new moms. It’s always good to have some insight in this area! This is also a great place to start if you are looking to get into this field. This resource will continued to be added too as I learn of new opportunities. If you know of something great feel free to email me and I will add it to the list of online continuing education courses for pediatric physical therapists, pediatric occupational therapists, and speech and language pathologists.